Support SUNY Delhi's Lacrosse team and purchase some gear! SUNY Delhi Lacrosse - Under Armour® S/S Tech™ Tee. 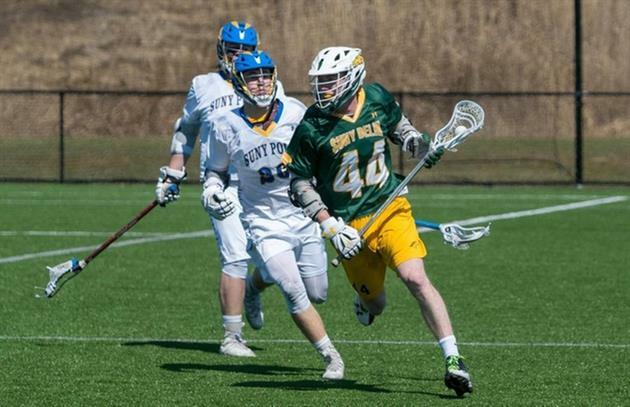 SUNY Delhi Lacrosse - This UA tee has lightweight brushed fabric with soft comfortable hand and superior moisture transport and enhanced dry times. Features raglan construction and cover-stitched seams for comfort/mobility, 1x1 rib detailing at collar and anti-odor technology. HeatGear, Loose. Imported. Product Materials: 100% Polyester. SUNY Delhi Lacrosse - Under Armour® Triblend Fleece Hoodie. SUNY Delhi Lacrosse - This UA hoodie has ultra-soft Triblend fleece that traps warmth. Features front kanga pocket and self cuffs and hem. ColdGear, Loose. Imported. Product Materials: 54% Cotton / 36% Poly / 10% Rayon.